After the British Treffen we headed north toward Scotland going up through Wales. Wales is a small country on the west coast of Britain that was conquered by King Edward I in the late 13th C. Today it is still proudly Welsh with their language placed first on all the signs. 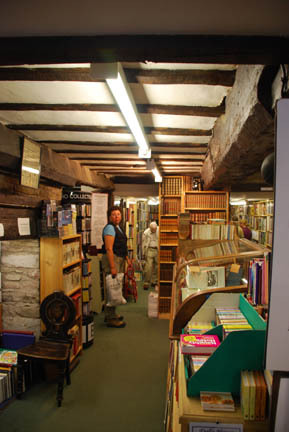 Our first stop was in Hay-on-Wye in the Wye River valley, the "town of books". 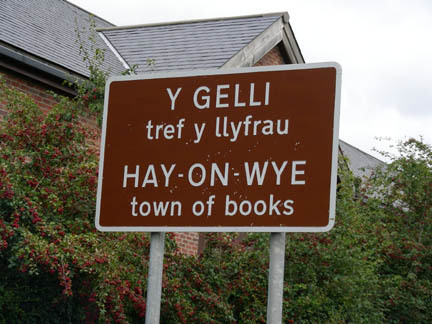 This town was reported to have over forty used-book stores. 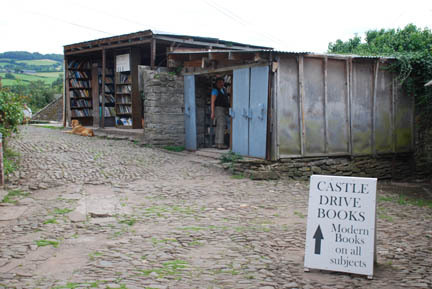 We were a little disappointed because some of the stores were nothing more than a tin shed with old, moldy, picked over books nobody wanted . But most of them were warrens of narrow aisles and small rooms in old building. We did find prices to be very good and bought more than we should have. I believe that if one knew what they were looking at and spent enough time looking in this town that they would probably find some very rare books or manuscripts in one of the dusty old back rooms. (Sort of like finding a real treasure in a garage sale.) There was even a store that specialized in antique maps. You know, you've seen prints of old maps drawn in the 16th, 17th or 18th century for sale in tourist shops or junk catalogs. Well, these were the real thing, in cellophane sleeves, but in racks where you could handle them and choose the ones you wanted. But although I was interested in some, the prices of 50 to several hundred British Pounds (at two US dollars to the Pound) each was too much for me. In one town we saw this post and beam market building. 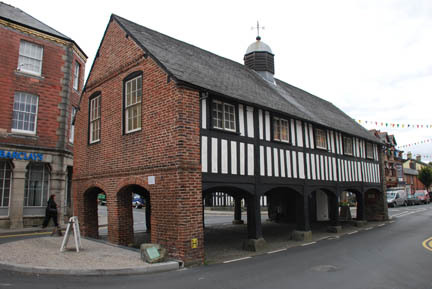 The ends are brick but the building is hand hewn and pegged beam construction. At one time most towns had one of these. It is sitting in the middle of the main street at an intersection and traffic flows around it on all four sides. Later that afternoon, while passing a truck in a short passing zone (I was accelerating hard to get around) the engine quit. Just as if it was out of gas. I coasted across in front of the truck and onto the narrow shoulder of the road. A week earlier we had the same problem and I had changed the fuel filter and it appeared solved. This time I checked the fuel filter, it looked fine. When I disconnected it and cranked on the engine lots of fuel came out. So that wasn't the problem this time. Eventually I gave up trying to start it and walked to find a phone at the little village about a mile behind us. I asked a couple who were working in their garden if there was a pub nearby that a phone I could use. They said there wasn't but that I could use theirs. We had a list of the GoldWing Club of Great Britain members and I called until I got one to answer. He called around and found where there was a repair shop and we called it. It was busy and suggested another, who was busy and suggested another. Finally it was too late and they're all closed. At this point Owen, the man who's phone I'm using, suggested he take our trailer and Kathy to the campground in town and I agreed. 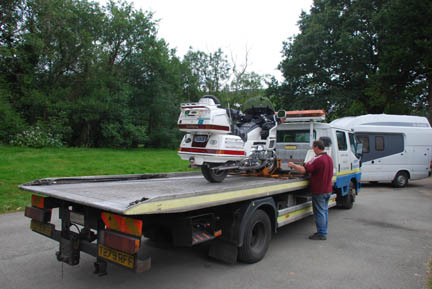 After he did that he borrowed a small trailer and came and got the bike too. The next morning I used the phone at the Vanner Abbey Farm campground office to call some more, with no luck. All the Honda shops within 50 miles are very busy. Then the campground manager suggested I talk to the owner of the Bikers Retreat, a B&B in the nearby town. Owen gave me a ride and I talked to the owner. He called around and found a small independent repair shop in a town about 12 miles away who would look at it. The mechanic had never worked on a GoldWing before but this was my best solution. We called a wrecker and had the bike hauled to the shop. The shop, D.A.M.S. Racing, is in a old gas station and run by a man and his wife (I didn't get their names). It is clean and busy with several projects under way. He is working on the front suspension of a car and took a break to move my bike into the shop. We discussed the problem and he told me what part of the bike he wanted to see and then I removed the plastic until he could check it out. The first was to get to a spark plug and check for spark. There was good spark so we headed for the carburetors. He checked the filter and the fuel pump. After the filter, but before the carburetors is a vacuum activated fuel pressure regulator. No fuel was coming through this. So he took it apart and found that the diaphragm was split. The picture is out of focus but you can clearly see the split in the diaphragm. We called around and the nearest replacement part was about 3 weeks away. So he made a replacement one. 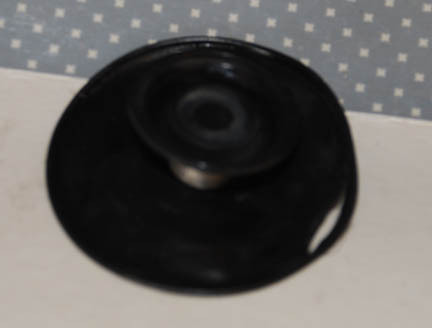 He took another diaphragm and cut it to fit and glued it to the back of this one. After it dried we put it in and the bike fired right up. So we put all the plastic back on the bike and I rode it back to the campground where Kathy was waiting. While at the shop I had called Peter Russell, the International Representative for the GWRRA and asked him to see if he could find the part for me. We will be visiting him in about two weeks in London and can pick it up then. He said he would. So now we are back on the road again, a day late, and headed for Porthmadog. All of the Welsh people that we talked to, or met face to face, went out of their way to help us. We can't thank them enough for their help and concern. 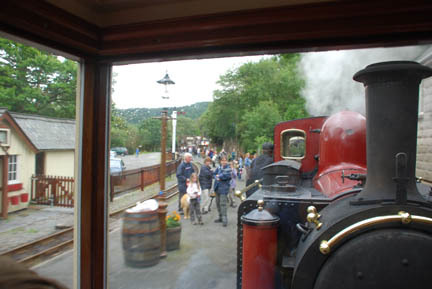 Porthmadog is one end of the narrow gauge railroad that runs about 13 miles up the side of Snowdonia Mtn. to the slate mining town of Ffestiniog. 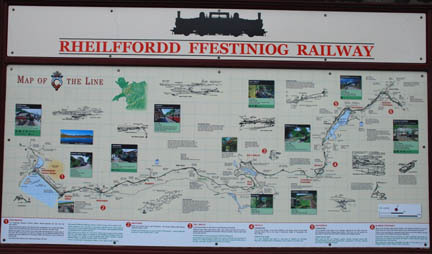 The route goes through tunnels, past fields of sheep, over trestles and round in a 360 degree loop, crossing over itself. You can see the loop at the right on the map where the line turns north. At the end of the rail line we took the bus up to the slate mine and toured it. Slate from Wales was exported to every continent as roofing material and was used in schools for blackboards and even as a bed (below the mattress). The miners and other workers worked 12 hour shifts 5 days a week, a half day on Saturday and were required to attend 3 church services on Sunday. The slate was in layers with layers of chert in between . The layers were 10 to 40 feet thick and on a 30 degree angle from horizontal. The slate was removed from its layer in a strip 40 feet wide and then a strip 30 feet wide was left to support the chert layer. There was about a dozen of these layers of slate being worked. 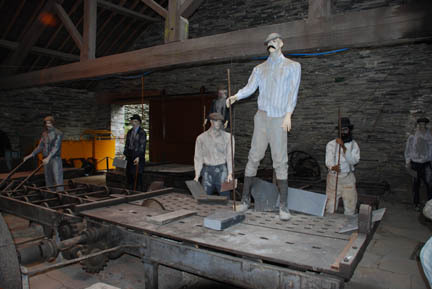 There were two tours and we took both tours, the first was the tram tour that went to several of the places where the slate had been removed and they had set up displays, with mannequins, of the miners. The picture at left shows the tram we rode and the chert ceiling at the 30 degree angle. This was all on one level. 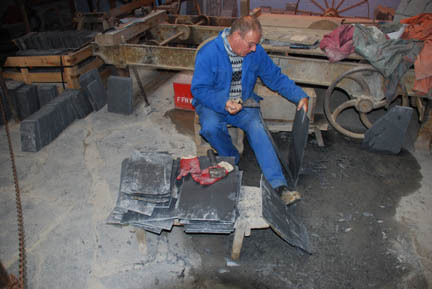 Here is a worker loading a cart with blocks of slate. The slate was removed by making a tubular hole in the slate a couple of feet deep with a hand chisel about 5 feet long and filling it with gunpowder and blowing the block of slate loose. They were then marked with the crew's number and sent to the surface for finishing. The miners worked by candlelight and each crew had to buy its own candles, chisels and gunpowder. If anything was left over on payday, they could have a beer in the company store or pay the rent on the company house. It was a rough life. After the slate made it to the surface it had to be cut to size and split to thickness. The record seems to be a piece that was 10 feet long, 1 foot wide and 1/16th inch thick. It was done as a demonstration for a royal visit many years ago. Yes, that is a live human in this picture. And he has just split the slate, one half is leaning against his knee the other is in his hand. 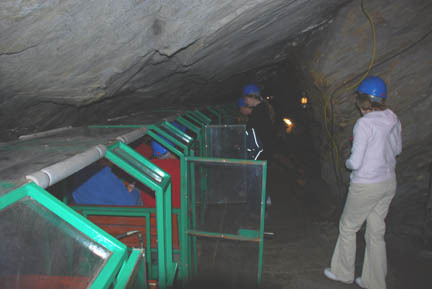 The other tour we took was the deep mine tour. It includes a ride on Britain's steepest passenger rail line. 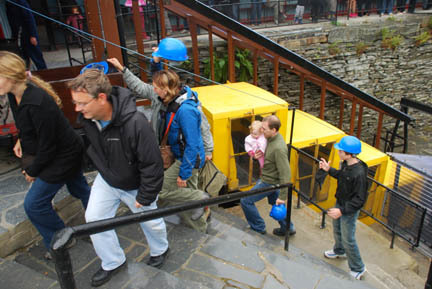 It is a 1.8 to 1 slope and drops about 500 feet to the level for the tour. In this picture we have arrived back at the surface and are turning in our hard hats. 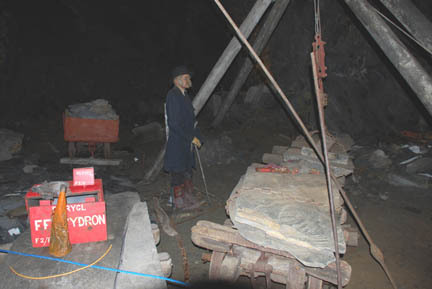 The hats were needed because much of the tunneling between the slate areas was less than six feet high. The deep tour was a walking, self guided tour through several hundred feet of tunnels and listening to a programmed talk and light show. It was well done but was essentially the same as the human guided tour on the tram. More walking, less riding, but the same working spaces, just farther down in the mountain. The tram ride was more interesting, but now we've been on the "steepest passenger railway in Britain". Back down the mountain on the train. We had bought first class tickets and rode up in a "vintage" carriage from the 1800's with separate compartments for first class, one of which we had to ourselves. On the way back down we got seats in the first class car on the end of the train with windows all around. On the way up these seats had all been reserved and the car was at the back of the train. They moved the engine to the other end and it was now right in front of us. We had an excellent view of it as we traveled down the mountain. Next stop is the castles of King Edward I. When Ed took over the British throne in the late 1200's the Welsh decided not to continue bowing down to the British king. It was a mistake, Edward attacked and built a string of castles through Wales to subjugate them. He almost bankrupted his throne doing it. 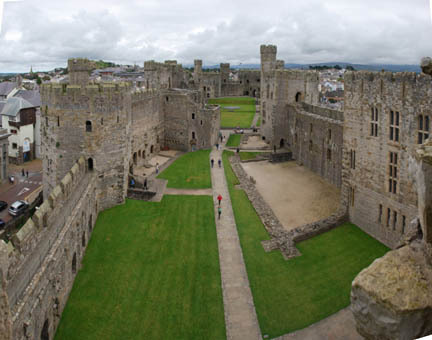 We visited three of his castles, Caernarfon, Beaumaris and Conwy. These castles are all in north Wales and represent different styles of building. Edward had been to the Holy Land on a crusade and had seen castles there and in much of France and incorporated features he saw there in his castles. Caernarfon was the first castle we visited. It sits on the seafront and like all of Edwards castles has an attached town with a defensive wall. (He wanted English families to move there and settle the area.) This one was built with two living areas with wall and rooms across the middle. (At the narrow spot in the center of the photo.) The king was planning to use this as his personal castle when in Wales and the close half was to be for him and the queen. Beaumaris castle was our second one. It is near the seaside but is in a flat plain and so has a different defensive structure. It has a moat and twin walls. Swim the moat and climb the wall and you are looking at a second wall to climb, very difficult to do. But Edward never finished this castle. It was to be twice as tall (in the interior section) but the second story and several of the interior buildings were never completed. Conwy Castle was also a seaside castle but it sat on a small rock outcropping making it very difficult to conquer. These castles had wooden floors and roofs on the interior buildings which have all rotted away many centuries ago. All three of these castles were built between 1280 and 1320. Of these three our favorite was this one. It had more to explore and see and looked more like we imagined a medieval castle to be. All of the castles have circular stone staircases to get from floor to floor. The parapets were just a rough and uneven as when Edward's troops strode them. In no way were these sites "handicap accessible" and in no way could have been made so without destroying the look of the place.. In the USA it seems that if it can't be seen by everyone (wheelchairs included) then it's closed to everyone. I like this attitude better. Wherever reasonable they have made arrangements for the mobility impaired, but when it's not possible it isn't worried about. 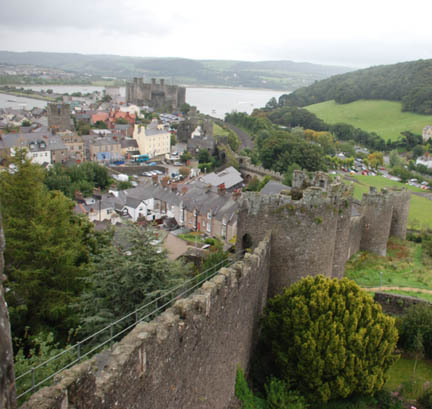 The town of Conwy was built within a defensive wall. And here it has the walkway along the top open for tourists to stroll along. In this picture the wall stretches out from below us at the far corner all the way to the castle in the distance. The wall has rounded "towers" spaced along it for defensive bowmen to shoot arrows at invaders at the base of the wall. King Edward I had several thousand troops stationed in his string of castles and forced Wales to bow to his authority. Today Britain still rules Wales with the heir to the throne known as The Prince of Wales. These castles have not been extensively rebuilt as the Almodóvar Castle we visited last winter in Spain had been. It could have been lived in. These are essentially as King Edward I left them, with the weathering of the ages added and in a way more interesting. Now it is on to Scotland.